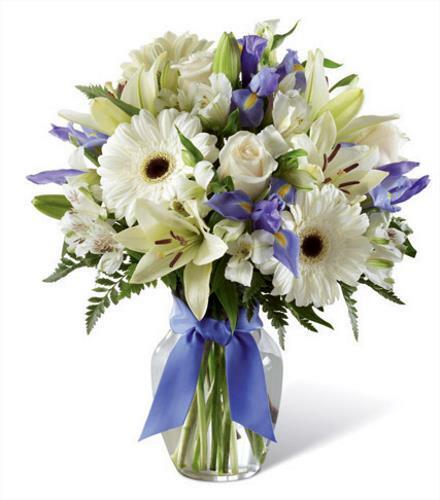 The Miracle's Light Bouquet celebrates each miraculous moment. . Blue iris creates a splash of colour against a backdrop of white roses and white Asiatic lilies accented with lush greens, silver pinecones and blue and organza ribbon, gorgeously situated in a clear glass ginger jar vase. Celebrate your special occasion with the Miracle's Light Vase B19-5142.